O'Leary was not targeted during Sunday's 42-17 loss to the Bills. He finishes the season with eight receptions for 86 yards and one touchdown. O'Leary was not targeted during Sunday's 17-7 loss to the Jaguars. Analysis: O'Leary has now gone three consecutive games without catching a pass. Despite being listed as the No. 1 tight end on Miami's depth chart, O'Leary remains solidly off the fantasy radar. O'Leary did not catch his only target during Sunday's 41-17 loss to the Jaguars. Analysis: Despite being listed as the No. 1 tight end on the Dolphins' depth chart, O'Leary has been almost invisible in the passing game. With only 14 receiving yards and no touchdowns to speak of across his last seven starts, O'Leary is not worth rostering in most fantasy formats. O'Leary was not targeted during Sunday's 34-33 win over the Patriots. 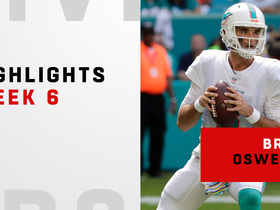 Analysis: O'Leary led Miami's tight ends in terms of offensive snaps (24), but did not manage to record a single offensive statistic during Sunday's divisional win. Rookie Mike Gesicki was the only tight end on Miami's roster to be targeted Sunday. With only two receptions for 14 yards under his belt through the last six games, O'Leary will remain off the fantasy radar heading into a Week 15 tilt against the VIkings. 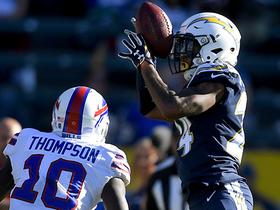 O'Leary caught his only target for nine yards during Sunday's 21-17 win over the Bills. Analysis: O'Leary was the only tight end on Miami's roster to catch a pass during the Week 13 win, and he once again recorded more snaps (32) than second-round rookie Mike Gesicki (22). The Dolphins likely will continue to field a rotation of A.J. Derby (foot), Gesicki and O'Leary at the tight end position for the remainder of the season, which severely hampers the fantasy upside of all three players. O'Leary has not seen more than one target in a single game since Week 7. O'Leary agreed to a one-year extension with the Dolphins on Saturday, Ian Rapoport of NFL Network reports. Analysis: The extension is worth $1.5 million with $500,000 guaranteed. Primarily considered a run-blocking tight end, O'Leary has seen just eight targets in his first season with the Dolphins, ceding snaps and receptions to the likes of Durham Smythe and Mike Gesicki in recent weeks. Given Gesicki's status as a 2018 second-round pick, it's unlikely O'Leary will unseat the rookie for a starting role next year despite the obvious endorsement that comes with a contract extension. O'Leary was not targeted during Sunday's 27-24 loss to the Colts. Analysis: O'Leary is listed as the top tight end on Miami's depth chart, but he saw less targets (zero) than either of rookies Mike Gesicki (one) or Durham Smythe (two) in Week 12. The Dolphins could be eager to take a good look at their rookie options before heading into the offseason. O'Leary has seen only one target in his last four games, and he remains firmly off the fantasy radar for the Week 13 tilt against the Bills. O'Leary brought in his only target for five yards during Sunday's 31-12 loss to the Packers. Analysis: O'Leary logged his lowest offensive snap count of the season (21) with A.J. Derby healthy for the first time since Week 3. It appears that O'Leary will split tight-end targets down the middle with Derby and Mike Gesicki in Miami's already-limited passing attack, so it's difficult to imagine O'Leary possessing weekly fantasy relevance going forward. O'Leary was not targeted during Sunday's 13-6 win over the Jets. Analysis: O'Leary has now gone two straight weeks without recording an offensive stat. Despite O'Leary leading Miami in snaps at the tight end position (33) and being listed as the team's No. 1 option, Brock Osweiler's only pass thrown to a tight end Week 9 went to Mike Gesicki. Since recording four catches, 49 yards and a touchdown Week 6, O'Leary has failed to put up relevant fantasy numbers. O'Leary nabbed two of three passes for 23 yards in Miami's 32-21 loss to the Lions on Sunday. Analysis: O'Leary logged a larger snap count than fellow tight end Mike Gesicki (shoulder), but was outgained by the rookie's 44 receiving yards. As long as A.J. Derby (foot) remains sidelined, expect O'Leary and Gesicki to continue splitting snaps and targets. O'Leary started at tight end Sunday and finished with four receptions for 49 yards and a touchdown on four targets in the Dolphins' 31-28 overtime victory over the Bears. He played 52 of a possible 78 offensive snaps (67 percent) in the contest. 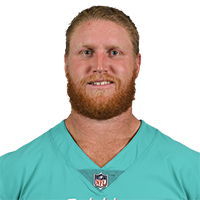 O'Leary was promoted to the Dolphins' active roster Friday. Analysis: With A.J. Derby (foot) out Week 5, the Dolphins promoted O'Leary for depth. 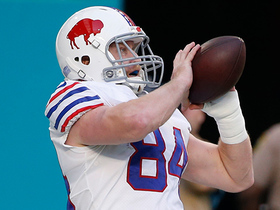 The 26-year-old tight end caught 22 of 32 targets for 322 yards and two touchdowns for the Bills last year. He'll be the No. 3 tight end against the Bengals on Sunday and shouldn't be considered in fantasy settings. O'Leary signed with the Dolphins' practice squad Thursday, Safid Deen of the South Florida Sun Sentinel reports. Analysis: O'Leary spent the last three seasons with the Bills but failed to make the final 53-man roster for 2018. Since starter MarQueis Gray suffered a torn Achilles, the Dolphins have been using a three-tight end committee, so O'Leary could ultimately become a viable option for the team should Miami continue to struggle with production at the position this season. O'Leary was part of Saturday's roster cutdown, John Murphy of the Bills' official site reports. Analysis: The writing was on the wall for the fourth-year tight end. Even though O'Leary served as the main backup for Charles Clay for much of his first three pro years, Jason Croom had a far better camp and preseason, and from there the Bills needed better blocking options than O'Leary for the third and fourth spots. O'Leary led the Bills with four catches for 70 yards, including a 35-yard touchdown catch, during Friday's preseason win over the Browns. "He made a big play for us. I thought Nate [Peterman] did a good job of finding him," coach Sean McDermott told Mitchell Courtney of the Bills' official site. "Nick is a good football player. He's played a lot of snaps for us, so I was happy to see him reap the benefits of his hard work." Analysis: O'Leary headed into camp as the No. 2 tight end, but he's been pushed by Jason Croom, Logan Thomas, Khari Lee and Keith Towbridge to the point where he's been seeing action with the third team, as was the case for part of Friday's game. He probably saw so much action partly so the team can determine if it wants to keep him or cut him. Consider his performance Friday a win toward trying to beat out his competition. O'Leary, who's served mostly as the primary backup tight end the last three seasons behind Charles Clay, might be on the roster bubble with new candidates emerging in training camp, Sal Maiorana of the Rochester Democrat and Chronicle reports. O'Leary (ankle) did not catch a pass in Thursday's 28-23 loss to the Panthers in the preseason opener. Analysis: O'Leary's prior ankle issue didn't prevent him from suiting up Thursday, but his lone contribution to the stat book came in the form of a tackle on special teams. The tight end will look to get more involved with the offense in next Friday's exhibition outing against the Browns. O'Leary (ankle) has returned to practice, Mike Rodak of ESPN.com reports. Analysis: O'Leary was limited early in training camp, but he appears to be fine heading into Thursday's preseason opener against the Panthers. He could receive a good number of reps with Charles Clay and the starters likely to see limited action. O'Leary (foot/ankle) was limited at Tuesday's practice, Mike Rodak of ESPN.com reports. Analysis: O'Leary limped off the practice field Saturday and was spotted in a walking boot Sunday, but it turns out his injury isn't too serious. He's locked in as the Bills' No. 2 tight end, with the potential for a few more opportunities this season after averaging 10.1 yards on his 32 targets last year. O'Leary (foot/ankle) wore a walking boot Sunday, Dan Fetes of WROC Rochester reports. Analysis: One day after limping off the practice field, O'Leary was limited to spectator status while donning a boot on his injured right foot. His upcoming absence should free up first-team reps for Logan Thomas and Khari Lee in formations with multiple tight ends. Charles Clay is locked in atop the depth chart, but there's been some thought O'Leary could see an uptick in pass-catching opportunities after averaging 10.1 yards per target on 32 looks last season. O'Leary was spotted limping off the field at Saturday's practice, Mike Rodak of ESPN.com reports. Analysis: The extent of O'Leary's issue is not well known at the moment. Prior to limping off the field a second time Saturday, O'Leary originally left practice with an ankle injury but soon returned. Buffalo will likely go down the cautious route with O'Leary -- the team's likely No . 2 tight end -- given that it is just Day 2 of training camp. The Bills re-signed O'Leary -- an exclusive rights free agent -- this week, Chris Brown of the Bills' official site reports. Analysis: Starter Charles Clay is almost certain to be back for another season as well, so that leaves the pecking order pretty much the same as last season, with Clay, O'Leary and Logan Thomas as the top three guys heading into summer. The Bills are expected to address other needs instead of taking a top tight end in the upcoming draft, though it also wouldn't be a surprise if they added one in the middle to late rounds. The Bills extended the exclusive rights tender to O'Leary on Tuesday, ESPN.com reports. Analysis: O'Leary recorded a career-high 22 receptions for 322 yards and two touchdowns in 15 games with the Bills last season. Charles Clay is still the starter in Buffalo, but O'Leary will serve as a solid backup in 2018. O'Leary finished his third NFL season with 22 catches on 32 targets for 322 yards and two touchdowns. O'Leary (back) is active for Sunday's tilt against the Patriots. Analysis: O'Leary missed some practice time this week but was able to register a limited participation in Friday's session. He'll operate as the backup to Charles Clay once again this week. O'Leary (back) will be limited at practice Friday and listed as questionable for Sunday's game against the Patriots, Chris Brown of the Bills' official site reports. Analysis: With starter Charles Clay ready to suit up against New England, O'Leary will operate out of his No. 2 tight end role (assuming he plays), something that doesn't offer much fantasy value in a run-based offense. O'Leary (back) isn't practicing Wednesday, Chris Brown of the Bills' official site reports. Analysis: O'Leary's back issue sidelined him for the Week 13 loss to the Patriots, but after suiting up for both of the Bills' past two contests without any reported setbacks, the tight end should be available for the rematch with New England in Week 16. The tight end's absence Wednesday is likely maintenance-related, but he'll still probably need to put in a full practice Thursday or Friday before being removed from the Bills' injury report. O'Leary (back) wasn't listed on Wednesday's injury report. Analysis: O'Leary's back injury kept him sidelined for the Week 13 loss to the Patriots, but it looks like he'll be ready to go for Sunday's matchup with the Colts. The third-year player plays second fiddle to Charles Clay (knee) at tight end, so don't expect O'Leary to earn many targets Sunday unless Clay's injury prevents him from playing. Bills head coach Sean McDermott said Monday that O'Leary (back) will be back at practice this week, Joe Buscaglia of WKBW.com reports. Analysis: O'Leary was inactive for the first time all season in Sunday's loss the Patriots, but it appears the back injury will only cost him one week. Barring any setbacks during practice, expect O'Leary to be back for the Week 14 matchup against the Colts, working in a backup role to starting tight end Charles Clay. O'Leary (back) will miss Sunday's showdown with the Patriots, Chris Brown of the Bills' official site reports. Analysis: O'Leary injured himself during last week's win over Kansas City and will now miss his first game of the season. Khari Lee and Logan Thomas will likely share the various backup tight end responsibilities behind starter Charles Clay. O'Leary (back) is listed as questionable for Sunday's game against the Patriots, Chris Brown of the Bills' official site reports. Analysis: O'Leary has been targeted 26 times through 11 weeks, hauling in 18 receptions for 254 yards and one touchdown. If O'Leary is ultimately able to suit up Sunday, he'll continue to play second fiddle to fellow tight end Charles Clay (knee), who is expected to be available for the contest. O'Leary (back) is not practicing again Thursday, Mike Rodak of ESPN.com reports. Analysis: While he still might rally Friday, O'Leary has been taking a back seat to a mostly healthy Charles Clay in the offense once again. Couple that with his current injury and he's not a viable option this week, even though it would behoove the Bills to throw some surprises at the Patriots, a team that typically has their number. O'Leary sat out Wednesday's practice with a back injury and is considered day-to-day, Joe Buscaglia of WKBW.com reports. Analysis: It's suspected that the tight end's back issue stems from Sunday's win over the Chiefs. O'Leary has taken a backseat in the Bills' passing attack the last three weeks following Charles Clay's return from a knee scope, hauling in four passes for 33 yards and a touchdown since that time. O'Leary caught both his two targets for 18 yards in Sunday's 16-10 win over the Chiefs. Analysis: O'Leary was on the field for 43 percent of the offensive snaps, not all that much less than Charles Clay's 64 percent as the latter continues to work his way up to full speed from a knee injury. However, Clay is clearly Tyrod Taylor's main guy (4-60-0 on Sunday), primarily leaving O' Leary to handle blocking duties and serve as an occasional secondary target. O'Leary caught one of two targets for a seven-yard touchdown in Sunday's 47-10 loss to New Orleans. O'Leary's teammate Charles Clay (knee) is listed as questionable for Sunday's game against the Saints. Analysis: O'Leary has been starting since Clay underwent a minor procedure on his knee, but it looks like the starter will return in at least some capacity this week. Couple that with the team debut of receiver Kelvin Benjamin and it looks like O'Leary is about to become a more minor part of the offense. O'Leary brought in four of five targets for 51 yards in Thursday's 34-21 loss to the Jets. He also lost a fumble. O'Leary's teammate Charles Clay (knee) has been ruled out for Thursday game against the Jets. Analysis: O'Leary is no Clay, but before last week's one-catch dud against the Raiders he'd made a decent dent in the passing game, with a 5-54-0 outing against the Bengals and a 2-58-0 game against the Buccaneers. The grandson of Jack Nicklaus is still looking for his first TD of the season, but the Bills do throw to the tight end more than past seasons and he's probably a surprise top-15 proposition in a week loaded with byes. Miami Dolphins quarterback Brock Osweiler tosses a short pass to tight end Nick O'Leary for a 5-yard gain to convert on fourth down. 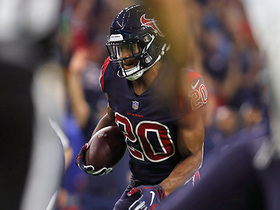 Houston Texans safety Justin Reid intercepts a throw from Miami Dolphins quarterback Brock Osweiler during Thursday Night Football of Week 8 of the 2018 season. 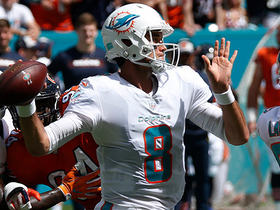 Check out highlights from Miami Dolphins QB Brock Osweiler in their Week 6 win over the Chicago Bears. 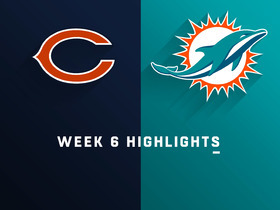 Check out highlights from the Week 6 match up between the Miami Dolphins and Chicago Bears. 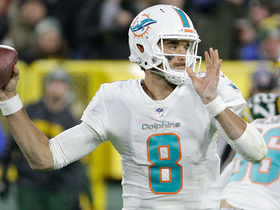 Miami Dolphins QB Brock Osweiler connects with tight end Nick O'Leary for a 5-yard touchdown catch. Buffalo Bills quarterback Tyrod Taylor throws to tight end Nick O'Leary for a 26-yard touchdown. 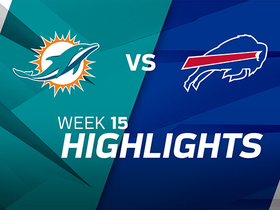 Watch the best plays from the week 15 matchup between the Miami Dolphins and Buffalo Bills. 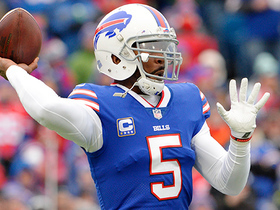 Buffalo Bills quarterback Tyrod Taylor trows to tight end Nick O'Leary for 25 yards. 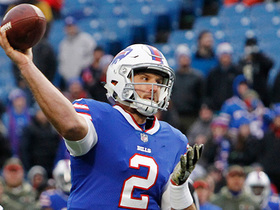 Buffalo Bills quarterback Nathan Peterman has a miscommunication with his receiver and throws his fifth interception. Buffalo Bills quarterback Nathan Peterman finds Nick O'Leary in the end zone for a 7-yard touchdown.